I got this recipe from Sarah's Blog . 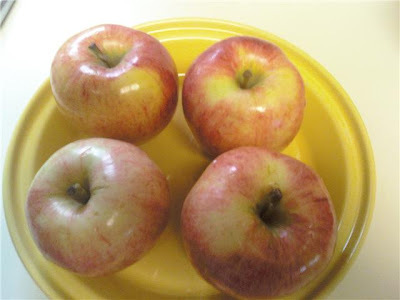 Butter or spray pie pan (8 or 9 inch) and fill 2/3 full with apple slices. 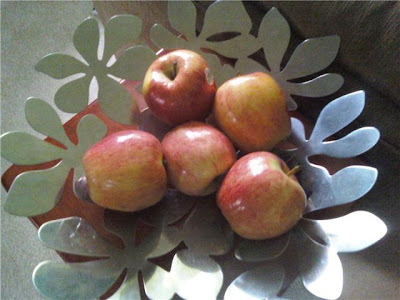 Sprinkle cinnamon and sugar mixture on top of the apples. 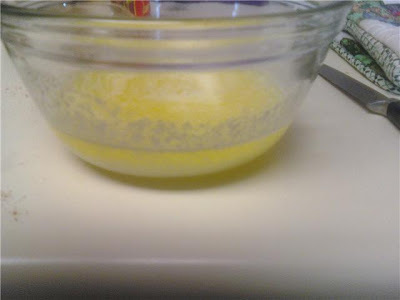 Melt butter, add sugar and egg and mix well. Add flour and nuts, pour over apples. I'm not sure if you can tell or not, but these apples were gigantic. 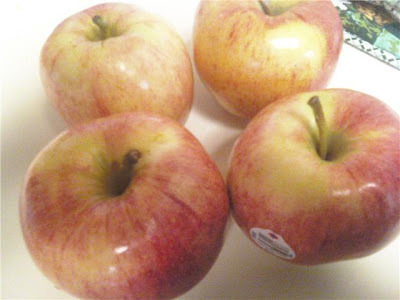 They are Gala apples (my favorite) and I only bought them because I had never seen Gala apples that huge before. 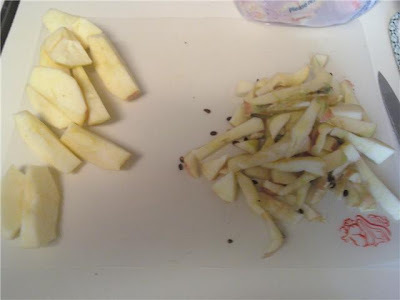 I'm not a pie professional, but I have heard that you should use the harder apples for pies (like Granny Smith), but I didn't have those, so I used Gala. My attempt at showing how huge the apples were. 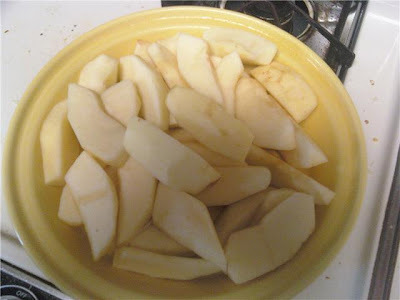 I could only fit four apples in my pie pan, so I decided that since they were large, and the recipe called for five medium, I would just use four of them. Peeling and slicing was the hardest part of this entire recipe. I don't peel apples, I just eat them. Someone told me one time that all of the nutrients are in the peel, which could be a bunch of crap, but that's my excuse for being lazy and just eating it. Those are my scraps for my compost pile. I couldn't fit those slices in the pan, so I really probably only used three apples. On the right is more scraps for compost. 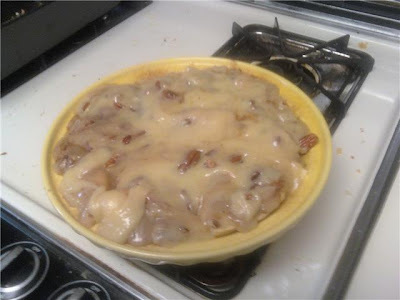 The pie pan with apple slices in it. 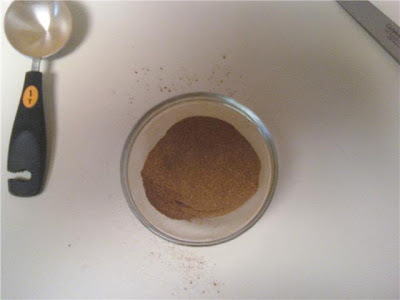 One tablespoon cinnamon mixed with one tablespoon sugar. I was really just excited to use my prep bowl that we got for a wedding gift. 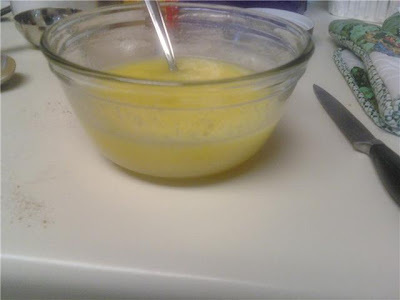 :) Two tablespoons is way more than I thought it was. 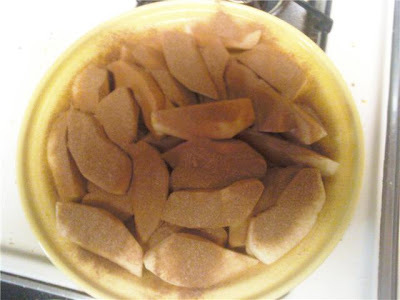 The apples covered with the cinnamon/sugar mixture. I didn't think it would cover this much, but they were coated. And it smelled soooo goooood. That is a lot of butter, folks. That is a lot of butter with sugar. 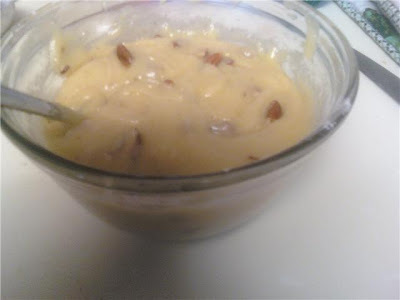 This is the butter, sugar, egg, flour, nut mixture. I just threw in a hand full of broken up pecans. It is really good though because it makes it crunchy. I might use a little more next time. Right before it went in the oven. The finished product. Yum. I took excessive amounts of photos. It was my first pie. It was really fantastic. If you make it, make sure you have vanilla ice cream...oh it's soooo good. If you can believe it, I didn't make very many changes to the recipe. I had to change the number of apples I used, but that isn't really a change. Our oven typically takes longer than what recipes call for, but I don't think 45 minutes would be enough anyway. I ended up having to cook it for one hour and ten minutes. One way to tell if it's done is to put a fork into the center (you're not going to mess up how it looks, it's going to be lumpy anyway). If the fork goes into the center apples easy they're cooked. Also, make sure you're not pulling out lots of the dough. I couldn't decide if it was done or not, but when I finally did pull it out, the center was pretty solid (just meaning the topping in the center wasn't liquidy on my fork). Seriously though, this couldn't have been easier. 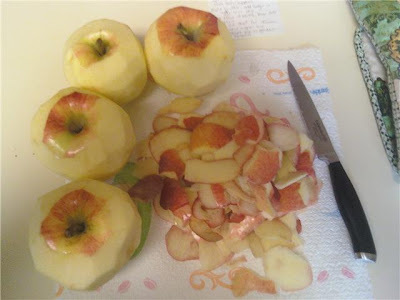 Well, it could have if I had bought pre-sliced apples, but I'm not rich so I'll keep slicing my own. And it tastes so good. But trust me, this is one for special occasions. I'm planning to distribute some to all of my family members who live within two miles of me today. If the two of us ate the whole thing we'd be in a world of hurt, especially with Nutella in the house, too! Sidenote: Megan pointed out that one of my goals is to make a homemade pie...I'm going to go ahead and count this. It's called a pie, it's in a pie pan...so it's a pie. What is that saying...if it walks like a duck?? Something like that.